A fragment of bone believed to come from the arm of Thomas Becket has been brought to Canterbury Cathedral this weekend. After services and public events in London beginning on Monday 23 May, the reliquary in which the piece of bone is set (pictured right), was brought to Rochester and then to Canterbury . 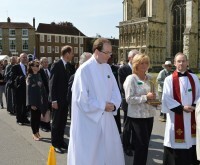 The pilgrims, including Hungarian Ambassador, Mr Péter Szabadhegy and other Hungarian delegates, walked carrying the relic from Harbledown on the outskirts of the city to the Cathedral. 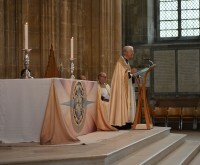 The pilgrims were greeted at the Cathedral by the Dean, the Very Revd Dr Robert Willis; the Bishop of Dover, the Rt Revd Trevor Willmott, the Lord Lieutenant Viscount De L’Isle and the Lord Mayor of Canterbury Councillor George Metcalfe. 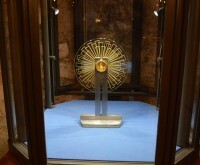 The relic was received and carried into the Cathedral where it was placed on the Nave Altar. A service of welcome was held before the clergy, guests and pilgrims processed into the Crypt, via the Martyrdom which is where Becket was brutally murdered in 1170. For more about St Thomas Becket and Canterbury Cathedral see here.